As I was grocery shopping the other night I decided to finally give this Trader Joe's kimchi a try. Something was telling me to give it a try this time, so I did. Can I just say that it was so good! Honestly, I think it even tasted slightly better than the one I buy at the asian market. For less than $3 this kimchi lasted me 3 dinners, which is not bad at all considering that I tend to eat a good handful with my meals. I have always wanted to try Kimchi! Looks yummy. that is surprising! i will have to try it out. 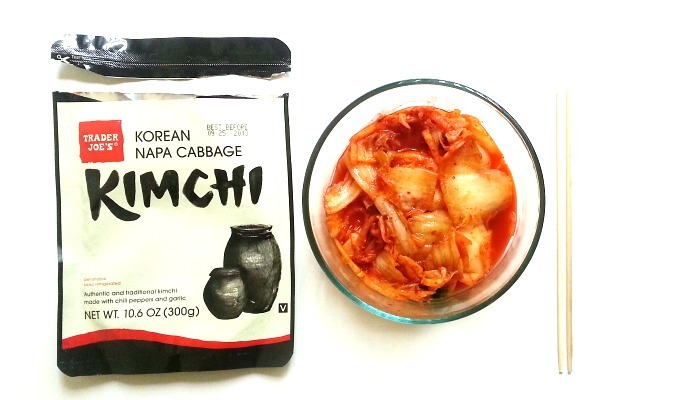 i'm still pretty spoiled with my mom's kimchi, but it would be nice to have an alternative. Lovely blog! Have a nice day! When I went to Korea, I tried my first kimchi. It was free because it was a side dish. (Side dishes are free in Korea) :P I'm in love with kimchi. I really need to get hold of that pack!